True to their academic roots, having been founded by five distinguished faculty members at the University of Minnesota, all of whom served as deans or department heads, The Norwegian Explorers of Minnesota have published numerous monographs and anthologies over the years. The first publication, The Crowded Box Room, in 1951, was written by one of our founders, Theodore C. Blegen (for whom Blegen Hall at the U. of M. is named.) The next year, in 1952, saw the first anthology, Sherlock Holmes Master Detective, edited by Blegen and E.W. McDiarmid, BSI, another founder and our long-time Sigerson. 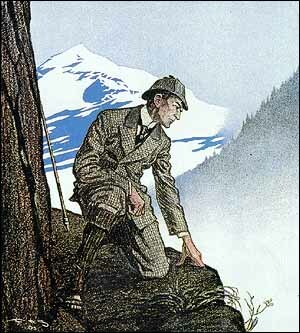 In 1957, the Explorers published Exploring Sherlock Holmes, edited by McDiarmid and Blegen, to commemorate the placement of a plaque at Reichenbach Falls in conjunction with The Sherlock Holmes Society of London. After more than a twenty-year hiatus, the Explorers published Cultivating Sherlock Holmes in 1978, edited by Bryce L. Crawford, Jr., BSI, another founder, and Joseph B. Connors. All of these now-classic works were printed as fine-press editions by Emerson Wulling of the Sumac Press in LaCrosse, Wisconsin. In 2007, the Explorers re-published these four volumes in a newly typeset edition along with new introductory material as the Norwegian Explorers Omnibus. Although the four original books are long out of print and can fetch a pretty price when they can be found, copies of the Omnibus, while they last, can still be purchased from the Explorers for the modest price of $19 postpaid. Since 2002, the Explorers have published The Norwegian Explorers of Minnesota Christmas Annual -- first edited by John Bergquist, BSI, then by Tim Reich, then by co-editors Tim Reich and Ray Riethmeier, and now by co-editors Ray Riethmeier and Phil Bergem, BSI -- each year during the holiday season. Copies of several editions from 2002-2017 are available (some in very limited quantities) and can be ordered from us for $10 each postpaid. If you are interested in contributing to our 2018 annual, see our Call for papers: The Norwegian Explorers Christmas Annual for 2018. The Missing Misadventures of Sherlock Holmes, edited by Julie McKuras, Timothy Johnson, Ray Riethmeier and Phillip Bergem, which was distributed to attendees of our 2016 conference "The Misadventures of Sherlock Holmes," can be ordered from us for $29 postpaid. PDFs of issues from Winter 2002 through Winter 2006 may be viewed here. Copyright © 2017 The Norwegian Explorers of Minnesota. For further information about this site, contact the Webmaster, John Bergquist, BSI.